LAKEWOOD RANCH, Fla. (Dec. 8, 2017) - The Boston Breakers U16/17 took down the Portland Thorns, 2-1, in the first game of the second day of feature games at the 2017 U.S. Soccer Girls' Development Academy Winter Showcase at Premier Sports Campus. Both teams came out with intensity in the first few minutes, earning chances early on. 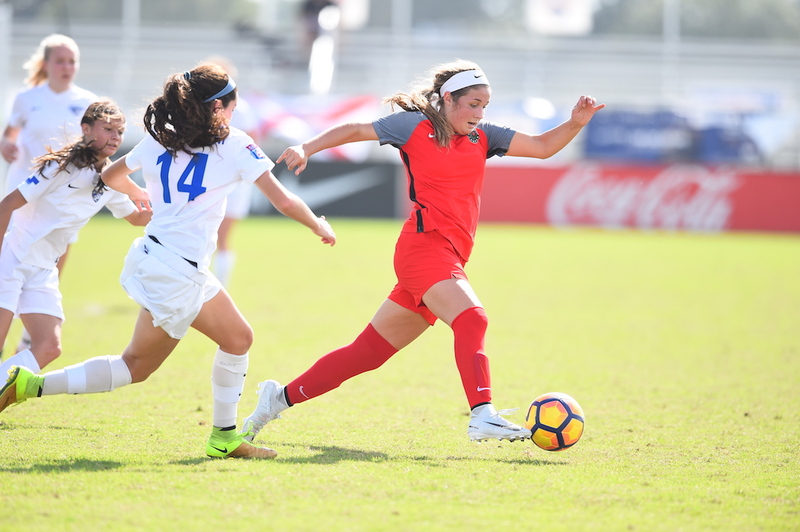 It was Boston that struck first however, when Claire Grover won the ball just past midfield and sent a lofted ball to teammate Mia Otero, who did a great job controlling it and found some open space to finish from distance with a grass cutter shot in the 6th minute. Two minutes later, Portland got itself back in the game with a goal from Jacqueline Blakeley, who won the ball in the back behind the defense, capitalized on the mishap from the Breakers and shot from the 18-yard line to tie the game at 1-1 for the Thorns with a left-footed shot in the 8th minute. No team could find a goal to put them ahead before the halftime mark, but in the second 45 minutes of play, it was Boston that came out red-hot and pressured Portland for most of the period. In the 76th minute, Boston drove into the box again as Eleanor Fisher looked for some open space ahead of her. Fisher was then brought down by Portland's Mia Gisher, causing the referee to point to the penalty spot. Otero stepped up and converted the kick to the lower corner to score her second of the day and give the Breakers the 2-1 advantage and final score line. The win was a nice rebound for Boston after the team had dropped its opening game of the Showcase on Dec. 7 against Seattle's U-16/17s by a score of 3-1.